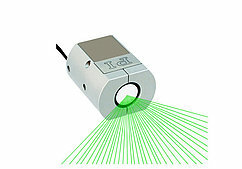 PInano® series nanopositioning stages feature a very low profile of 20 mm (0.8), a large aperture for 3 x 1" slides and deliver highly accurate motion with sub-nanometer resolution in up to 3 axes. Slide / petri dish holders optional. 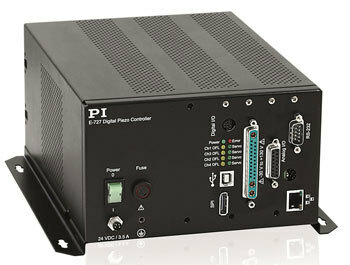 P-545 stage shown with included E-727 digital servo controller. 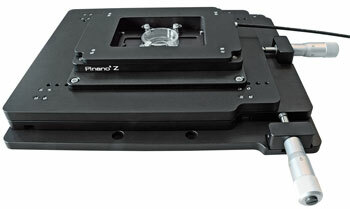 PInano® XY and XYZ low-profile piezo scanning stages are optimized for easy integration into high-resolution microscopes. They feature a very low profile of 20 mm (0.8") and a large aperture designed to hold Petri dishes and standard slide holders. The long travel ranges of up to 200 x 200 x 200 µm with nanometer closed-loop resolution are ideal for leading-edge microscopy and imaging applications. A) Highest Stability, Linearity and Precision with capacitive feedback sensors. B) High Precision with lower cost piezoresistive sensor feedback. Both types provide very high sensitivity and responsiveness as well as nanometer resolution. A proprietary servo controller significantly improves the motion linearity of the piezoresitive version compared to conventional piezoresistive sensor controllers. The compact P-545 systems are equipped with preloaded PICMA® high-performance piezo actuators which are integrated into a sophisticated, FEA-modeled, flexure guiding system. The PICMA® actuators feature cofired ceramic encapsulation and provide better performance and reliability than conventional piezo actuators. Actuators, guidance and sensors are maintenance-free, not subject to wear and offer extraordinary reliability. 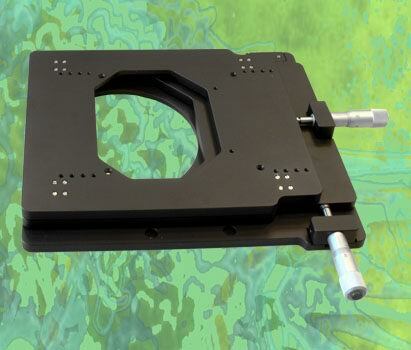 The optional M-545 manual XY stage provides a stable platform for the PInano® piezo stages. P-545 shown in a microscope. This version replaces the piezoresistive sensors of the original PInano® stage with direct-measuring capacitive sensors providing the for highest possible stability and linearity. Comes with upgraded USB controller equipped with high precision RF capacitive feedback circuitry. This version is based on an internal direct drive mechanism to provide a stiffer and faster responding stage featuring 70x70x50µm travel. It comes with a high power driver with analog input. This version is available in X, Y and also XY. It comes comlete with a controller and features a very low profile of only 17 mm. P-546 PInano® single axis / 2-axis model. X, Y and XY, with controller. The new PInano® Z low-profile piezo Z stages are optimized for very fast step and settle and easy integration into high-resolution microscope applications. They feature a very low profile of 0.8" (20 mm), a large aperture, and travel ranges of up to 200 µm with sub-nanometer closed-loop resolution–ideal for leading-edge microscopy and imaging applications. Longest lifetime is guaranteed by the integrated ceramic-encapsulated PICMA® piezo actuators. Due to the significantly higher humidity resistance, the patented PICMA® design provides up to 10 times longer life than conventional piezo actuators (latest test results are here). A special version for well plates is also available. PInano® series piezo positioning stages are available in two versions: a) Highest Stability, Linearity and Precision with capacitive feedback sensors. b) High Precision with lower cost piezoresistive sensor feedback. Both types provide very high sensitivity and responsiveness as well as nanometer resolution. A proprietary servo controller significantly improves the motion linearity of the piezoresitive version compared to conventional piezoresistive sensor controllers. Flexures optimized with Finite Element Analysis (FEA) are used to guide the stage. FEA techniques are used to give the design the highest possible stiffness in, and perpendicular to, the direction of motion, and to minimize linear and angular runout. Flexures allow extremely high-precision motion, no matter how minute, as they are completely free of play and friction. The PInano® Z stage comes complete with a powerful digital closed-loop controller. The controller features two digital interfaces (USB & RS-232) as well as a high-speed analog interface and is compatible with leading image acquisition software packages such as MetaMorph etc. The controllers are delivered including software for Windows operating systems. DLLs and LabVIEW drivers are available for automated control. The extensive command set is based on the hardware-independent General Command Set (GCS), which is common to all current PI controllers for both nano- and micropositioning systems. GCS reduces the programming effort in the face of complex multi-axis positioning tasks or when upgrading a system with a different PI controller. 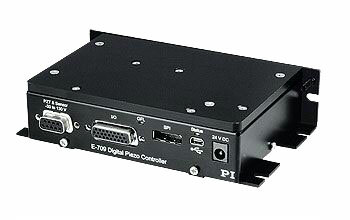 A compact piezo controller with a digital servo, USB, RS-232 and a high–speed analog interface is included. 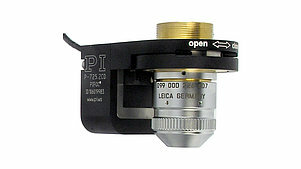 A large aperture version for well plates is also available. The PInano® Z stage can be combined with the M-545 high-stability, long-travel manual/motorized microscope stage (25 x 25 mm). Compared to conventional motorized translation stages, the PI ultrasonic motor stages provide a lower profile and smaller footprint. The compact PILine® ultrasonic piezoelectric linear motors and linear encoders make both, the lead screw duct and the flanged, bulky stepper motors employed in traditional stages obsolete. In addition, the piezomotors are self-locking at rest and hold the stage in a stable position without generating heat. 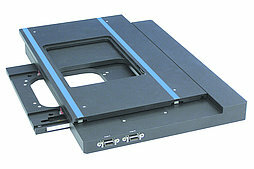 Piezomotor microscope stages are mainly designed for automated positioning applications in microscopy. The low profile height of only 30 mm allows easy integration. The mounting pattern is compatible with many PI piezo nanopositioning stages. 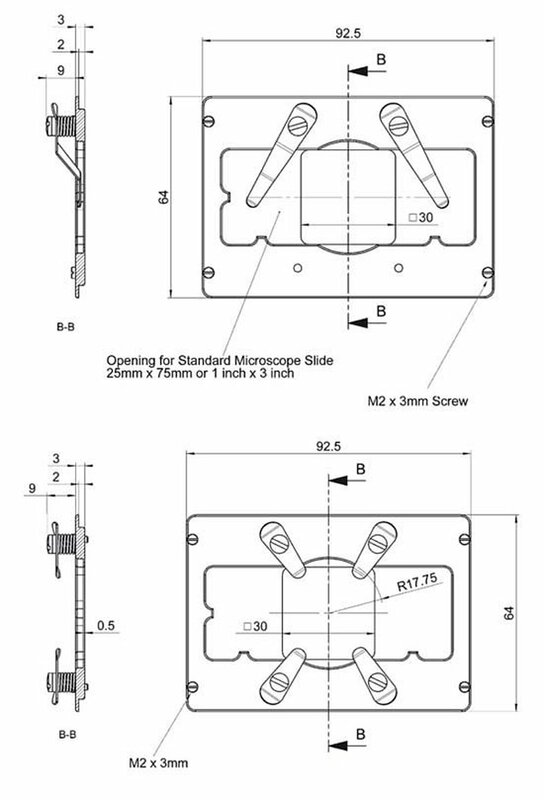 The M-545, 25 x 25 mm microscope stage, is designed to provide a stable platform for piezo scanning stages of the P-545 PInano® series. 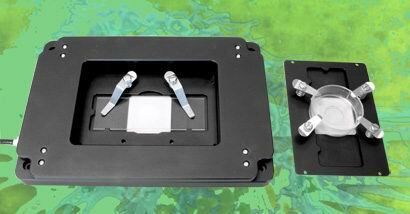 These high-speed, high-resolution XY / XYZ piezo stages allow nanometer-precision adjustment of the specimen holder in up to three dimensions over 200 µm. The M-545 is also compatible with the following capacitive-feedback type piezo stages: P-733, P-5x7, P-5x8, P-54x and P-56x. The basic M-545 model is equipped with manual micrometers.